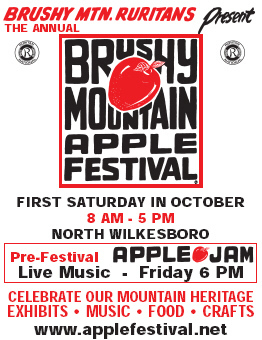 Only 169 days until the Brushy Mountain Apple Festival! Parking is available around the edge of the festival. However, this is on a first come first served basis. So, it does fill up. There is some free parking, but most of it is used by the more than 500 vendors we have. The fee parking is in the lots around the edge of the festival and is usually managed by local church youth groups and civic organizations and rural fire departments. We do offer a shuttle service. Look for signs on 421. Festival shuttle parking will be in the West Park Center. It is near the Hospital and Fairgrounds. If traveling East on 421, take 421 Business towards downtown North Wilkesboro. This road goes by Two Rivers Theatre and Arby�s on its way toward downtown. Buses run from West Park about every 20 minutes and take you into the festival. Buses will drop you off and pick you up at the edge of the festival. You do not have to carry "all that neat stuff" way back to the car. The shuttle service starts at 7 AM. As is with many of the food, drink and service items, you support community services when you purchase from many of our vendors and providers. If you are coming from Eastern Wilkes County on Rt. 268, you can follow the 421 Business signs through North Wilkesboro and this will take you to West Park Medical. It will be on the left, just past the Wilkes Regional Hospital. From 18 South, follow the 421 Business signs through North Wilkesboro to West Park Medical. It will be on the left, just past the Wilkes Regional Hospital. If you are traveling west on 268 from Western Wilkes County, take 421 North toward Boone and in approximately 0.5 miles, take a right onto 421 Business. West Park Medical will be about 1 mile on the right past Two Rivers Theatre and Arby�s on its way toward downtown. From 268 West, take 421 North towards Boone and in approximately 0.5 miles, take a right on 421 Business. West Park Medical will be about 1 mile on the right past Two Rivers Theatre and Arby�s on its way toward downtown. From 115 North, take 421 North towards Boone and in approximately 2.5 miles, take a right on 421 Business. West Park Medical will be about 1 mile on the right past Two Rivers Theatre and Arby�s on its way toward downtown. From 16 North, take 421 North towards Boone and in approximately 0.5 miles, take a right on 421 Business. West Park Medical will be about 1 mile on the right past Two Rivers Theatre and Arby�s on its way toward downtown. From 16 South, take 421 South. After passing Walmart, turn left onto 421 Business to West Park Medical. West Park Medical will be about 1 mile on the right past Two Rivers Theatre and Arby�s on its way toward downtown. From 18 North, take 421 North toward Boone and in approximately 0.5 miles, take a right on 421 Business to West Park Medical West Park will be about 1 mile on the right past Two Rivers Theatre and Arby�s on its way toward downtown.